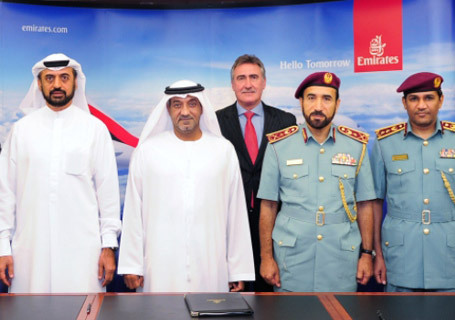 DUBAI, U.A.E., 25th June 2012: Emirates Group Security’s Centre of Aviation and Security Studies (CASS) has signed a Memorandum of Agreement (MOA) with the United Arab Emirates Ministry of Interior’s (Privatisation Services Group) National Security Institute (NSI). The MOA will strengthen security training standards and professionalism of the private security industry in the UAE. The United Arab Emirates has taken a lead role in civil private security services at the United Nations since 2008. This initiative is in line with the two UAE Resolutions brought before the UN (UN Res 18/2 of 2009 and UN Res L/2 of 2012), which call for international standards in private security regulations and training in order to enhance the role, oversight and contribution of private security to community safety. Signed by His Highness Sheikh Ahmed bin Saeed Al Maktoum, Chairman and Chief Executive Emirates Airline & Group and the Undersecretary of the Ministry of Interior Lt. General Saif Abdulla Al Shafar on 19th June, the MOA will achieve greater harmonization in security training and seek to professionalize security standards for private security services throughout the UAE. The establishment of CASS and NSI as partners to promote and develop a standardized security training package will benefit the entire UAE. Led by Dr Abdulla Al Hashimi, Divisional Senior Vice-President Emirates Group Security, and Colonel Ahmed Al Hantoubi, Federal Director of Ministry of Interior Private Security Business Department (PSBD), the cooperation marks a significant turning point in the regulation of security training in the UAE. The Agreement also acknowledges the work between the Ministry (PSBD/NSI), Department of Protective Services (Dubai Police) and Emirates Group Security to ensure that the UAE is setting the standard for security training globally. “This agreement allows us to further build on the professionalism and standards of an important industry that serves our communities in many ways. It will assist in expanding study as well as advancing further initiatives at both the national and international levels; keeping the UAE as a global leader in Civilian Private Security Services,” said Colonel Ahmed Al Hantoubi. “Through its Centre of Aviation and Security Studies, Emirates Group Security takes the lead in ensuring our organisation meets, and often sets the bar for, the highest private security standards. In partnership with Edith Cowan University in Australia, CASS provides cutting-edge education and training for security professionals,” said Dr Abdulla Al Hashimi, Divisional Senior Vice-President, Emirates Group Security. 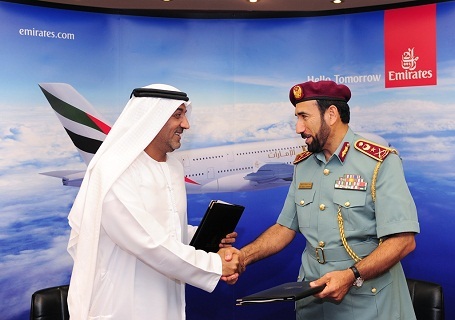 His Highness Sheikh Ahmed bin Saeed Al Maktoum, Chairman and Chief Executive Emirates Airline & Group, and Undersecretary of the Ministry of Interior Lt General Saif Abdulla Al Shafar at the 19th June Signing Ceremony.